As time goes by, we store more and more photos on our iPod Touch. Those photos all represent the most cherished memories we have. We just image that one day we can reminiscent of our old days via these photos. 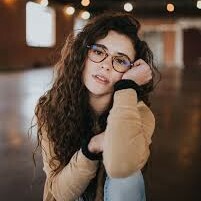 However, it is quite troublesome to keep those photos on iPod Touch, for it will make a harmful impact on iPod’s performance. In this case, it would be of great help to transfer photos from iPod Touch to USB flash drive. How can I transfer photos from iPod Touch to USB flash drive? Here is the fix. Let’s read the following guide to learn how to copy photos from iPod Touch to USB flash drive. 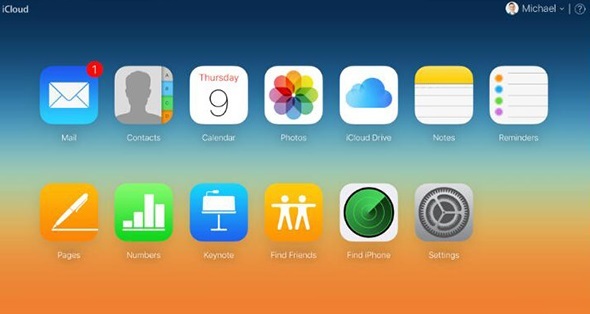 iCloud is always a helpful assistant for Apple users to handle iOS files in a super convenient way. 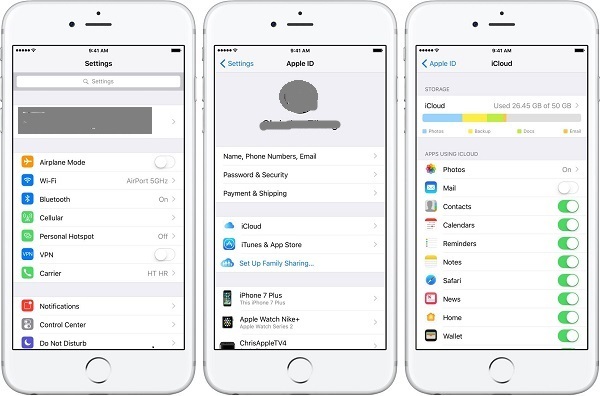 You can rely on it to transfer photos, contacts, videos and so forth between computer and iOS devices so as to prevent your files from losing. Check the following steps to see how to copy photos from iPod Touch to USB flash drive. 1. On iPod Touch, go to “Settings > Apple ID > iCloud” and click “Photo”. 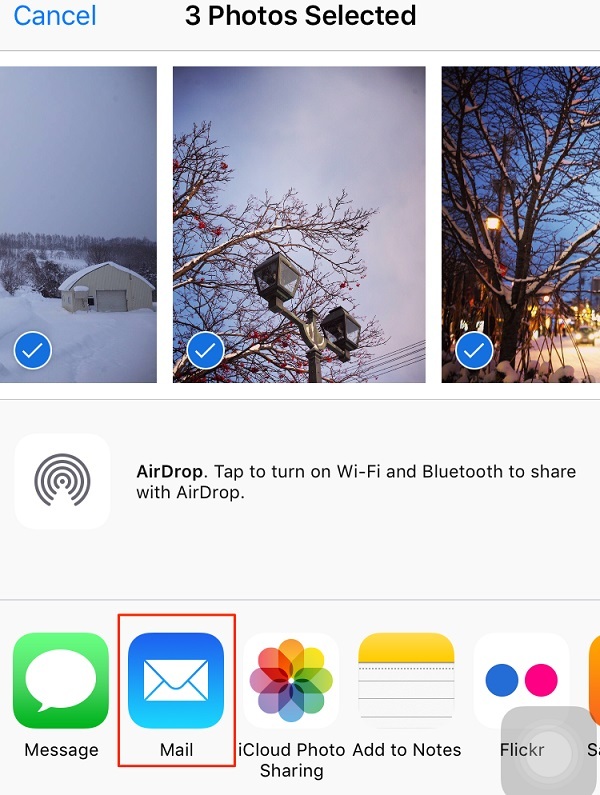 Scroll down and turn on “iCloud Photo Sharing” on. 2. Plug USB flash drive to your computer. Open the site and enter your Apple account and password. If it is your first time to log into the website in this device, it will require you to input verification code. Your iOS device will receive a verification code. Simply enter the code to log in. 3. You can see different icons representing different categories. Choose “Photos” and you will see a bunch of photos stored in your iPod Touch. This is exactly one of the methods to access iCloud photos. 4. 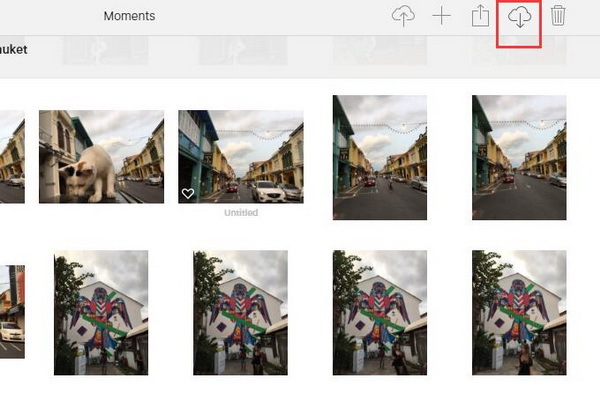 Select photos you want to copy by holding “Ctrl” and click on the downloading icon at top right corner. In the pop-up window, choose USB flash drive as the destination folder. The alternative to solve “how can I transfer photos from iPod Touch to USB flash drive” is via email. Email is able to attach any files and share to your friend or family. 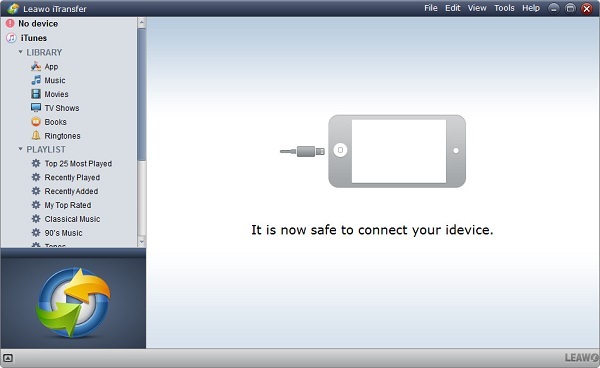 Thus, why not try to take advantage of Email to copy photos from iPod Touch to USB flash drive? 1. Open Photos app on iPod Touch. 2. Choose “Albums” and select the albums including photos you would like to copy to USB flash drive. Tap on “Edit” and check photos you want to transfer. 3. Now press Share button and choose “Mail” in the bottom window. Log into your e-mail and send it to another e-mail account. 4. On your computer, insert USB flash drive to computer and log into the receipt email to download the attached files to your USB flash drive. This is the solution to how to copy photos from iPod Touch to USB flash drive. iTunes is the most straightforward and simple way to transfer photos from iOS device to computer or external disk. It is a terrific transferring tool between iOS devices. How can I transfer photos from iPod Touch to USB flash drive via iTunes? Let’s read the following steps. 1. Plug iPod Touch and USB flash drive into your computer. You will be required to authorize iPod Touch to connect to computer. 2. Open iTunes and make sure you have the latest version on your computer. iTunes will automatically read iPod Touch and show an iPod Touch icon in the topleft corner. 3. Choose “File > Devices > Transfer Purchases from iPod Touch” and it will transfer all purchases including photos from iPod Touch. In the pop-up window, choose USB flash drive as the output directory to save those photos. As the above has introduced how to copy photos from iPod Touch to USB flash drive, some methods are not easy-to-use. For example, iTunes doesn’t allow you to selectively transfer photos you want to another device. Different from iTunes, Leawo iTransfer enables you to selectively choose any kinds of files like photos, movies, TV shows, apps and the like from iOS devices to computer or iTunes. With clear and modern interface design, it brings great convenience for users to use it. If you want to copy photos from iPod Touch to USB flash drive, you can also resort to this software. Insert USB drive and iPhone to computer. Launch Leawo iTransfer after downloading and installing it on your computer. The software will automatically scan iPod Touch. In the left sidebar, you can head to “iPhone > Library > Camera”. In the right interface, you can see photos on iPod Touch. Press “Ctrl” and select photos you need to transfer. 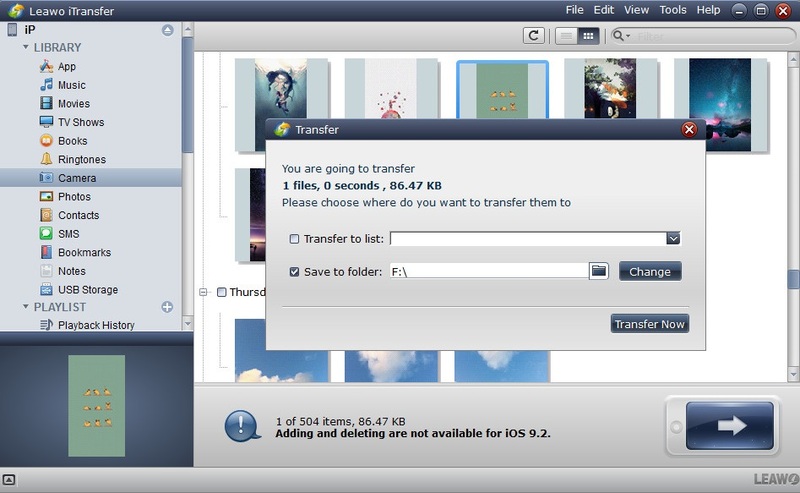 You can click the transferring icon at bottom right corner or right click the selected photos to choose “Transfer to > My Computer”. A dialogue will jump out where you can check “Save to folder” and click on “Change” to choose a destination folder. Choose USB flash drive as the output directory. 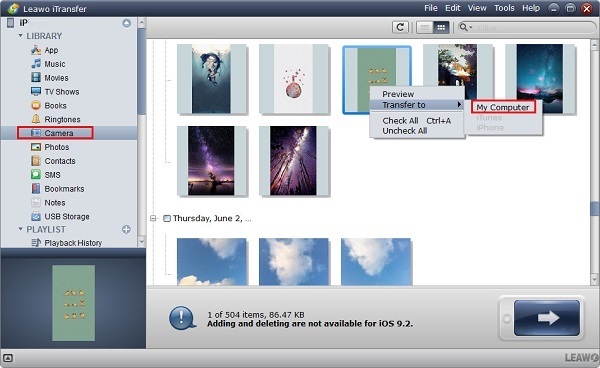 Afterwards, click on “Transfer Now” to transfer photos from iPod Touch to USB flash drive. If you want to transfer iPod music to USB flash drive, click here.